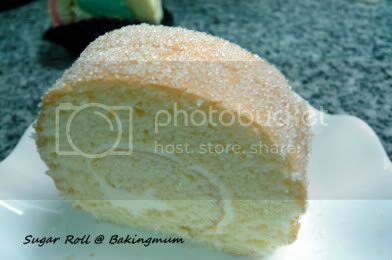 I am posting the sugar roll recipe which was taken from Aunty Yochana's blog. In the first picture you can see that the sugar roll was coated with sugar. However, tonight I just baked another batch of sugar roll but without the sugar coating as hubby requested for no-sugar coated roll. Since we have just bought a box of very sweet strawberry, he has requested that I add some to the sugar roll. 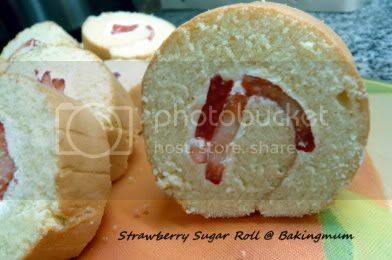 Thus you can see here my strawberry sugar roll without the sugar. (1) Whisk egg white for awhile, then add in caster sugar gradually. (2) Drop in the egg yolk one by one into the beating egg white until finish. Add in vanilla essence and continue beating for another 3 mins. (3) Stop the machine, fold in the cake flour and baking powder. (4) Fold in cornoil and pour into a 11" x 14" tray or 10" x 14" tray and bake at 200C for about 10 mins. (5) Take out from tray and leave on the wire rack to cool. 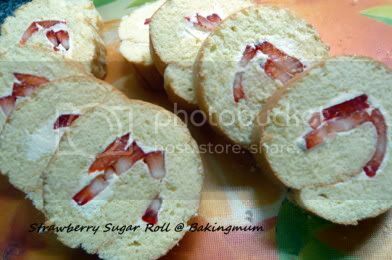 (6) Spread butter cream onto the cooled swiss roll and roll into a swiss roll. (7) Sprinkle some sugar onto a greaseproof paper and roll the swiss roll to and fro until evenly covered with the help of the greaseproof paper. (1) Boil the sugar with water until mixture thickens and while boiling, beat the egg white till frothy and pour in the sugar syrup and beat till mixture cools down. (2) Add in the chilled butter and shortening and beat till fluffy. (3) Add in coffee paste and kahlua. note: You might not use the whole recipe (butter cream) for this swiss roll. Keep the balance in the fridge and you can use it to decorate other cakes. If I make the recipe lesser, it's very hard to beat up the egg white. You can also double up the recipe and keep this butter cream for creaming all your cakes. According to tt, it's called "French Cream", if I'm not mistaken. * Note: I omitted the the coffee paste and coffee liquer and just made plain buttercream. Hi, love the sugar roll with strawberries.. Have been following your blog, but only have time to try only one of your recipe, the peach marshmallow cake. Will try to make time to try other recipes. another amazing swiss roll! is it possible to omit eggs and shortening for buttercream? Hi Tracie, yes you can omit egg and shortening but the butter may not be able to keep it's shape too long in our kind of temperature. Hi Anne, I just love the picture of the tomyam steamboat in your blog. Look so inviting and yummyliciously good. Hi Jenn, amazing collection of cookie jar. In Singapore it is not possible to keep our cookies in cookie jars due to the fact that our humidity is way too high to keep the biscuit crisp and nice. We usually keep our cookies in airtight containers instead. Hi! Beside using cake clour can use other flour for this receipe? May I know what brand of cake flour are you using? Hi Chris, you can use top flour or hongkong flour if you don't want to use cake flour. I am using the cake flour from Phoon Huat. can i find out how fast do u beat the eggwhites & egg yolks? and to what consistency can you stop beating them? Hi May, I used speed 6 to 7 on my KitchenAid mixer. I started adding the eggyolk when the eggwhite are beaten until glossy and medium stiff. I stop when the eggwhite and yolk mixture are well beaten until almost stiff. Ah Leng, when are you coming over for lunch? Tell me in advance and I make the sugar roll or strawberry roll for you. I was wondering, can I use the swiss roll recipe on 9"x12" tray?? Is it too small? I'm scare tat the sponge cake will turn out thick n will be pretty hard to roll. how about the chilled butter in the buttercream recipe... How can I beat that with the shorttening, its hard if it is chilled right? Gab, the butter is chilled, more like semi-hard rather than very hard. I have no problem beating it with my KA. Use the flat beater if you have. If not, just make sure it is not frozen hard but more like semi-hard when beating the butter. Gab, I forgot to mention, cut the chilled butter into smaller pieces will help in the beating also. anyway, last question about this butter cream recipe.. If I don't like to put the coffee paste, and the kahlua, the first four ingredients will just be a plain and simple buttercream right.? Because im going to bake a spongecake again and I want to frost it with the buttercream..
Gab, I have stated in my note that I have also omitted the coffee emulco and Kahlua to make it plain buttercream. Thanks once again for sharing this lovely recipe. i did a batch using mango with fresh cream, the result was great! Didn't use buttercream cos I'm on diet..haha..
My ds bday will be coming and he would love to have a thomas the train cake, wonder if i could wrap up the swiss roll with fondant and make it into the shape of a train.. Could u give me some advice and idea? thank u so much! 40g melted butter instead of corn oil? I notice the preparation for sugar roll is different from swiss roll. 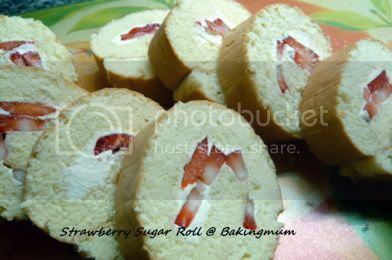 Would my sugar roll turn out the same if I choose to follow swiss roll method?